The patient may acquire a nuclear lesion of a cervical intarvertebraI disc by looking up suddenly from a bent-over position or from some similar slight trauma. He may attribute it to driving on a cold day with his window down, More commonly he awakens in the morning with a stiff and painful neck as the result of a flexion-rotation motion of his cervical spine during sleep. He is likely to attribute it to a draft. Exacerbations are induced by similar actions. Dorsal lesions, both initially and recurrently are sometimes suffered from heavy lifts. Lumbar lesions may occur from bending to pick up light objects from the ground. Exacerbations may be caused in the same way, of by stepping unexpectedly off a curb, or even by coughing or sneezing. Nuclear lesions are also likely to occur in severe spatial injuries - fractures and fracture-dislocations; - where they account for the patient's unexpected failure to recover after a reasonable lapse of time. The "whiplash injury" of the spine suffered in vehicular accidents is almost always a nuclear lesion or lesions. It may be either the initial attack or an exacerbation. Although the accident which precipitates a nuclear lesion is usually a trifling one, the sequelae are often disastrous to the patient. The lesion is the result of a simple combination of flexion and rotation of the spine which stretches fibrillae in the posterior part of the nucleus and then in twisting, applies the powerful force of torsion, and snaps them. A small pool of jelly is thus formed which contains no intact fibrillae. If the initial rupture is of only a few nuclear fibrillae, the blob of loose jelly may be too small to be perceived by the end organs of the nervus sinu vertebralis. Immense numbers of fibrillae surrounding this minute droplet are moved from their normal course, thus stretched and rendered more vulnerable to fracture by any movement of the spine. Hence, it may take a f ew hours, or a few days, for the pain to become severe. The patient may continue working the first day, have difficulty the second day, and be completely unable to continue on the third or fourth day. If the free pool of nuclear jelly is of an appreciable size, the pain may be severe enough to immobilize the patient on the spot. The patient lies on the floor, afraid to make the slightest spinal movement. While he is lying down and motionless he is much relieved. The pain, though it may be excruciating, is diffuse and usually poorly localized by the patient. He shows where it is by running his hand over a considerable area of his back or neck. If the attack is an exacerbation after he has reached the stage of radiating pains he will point out the radiation by passing his whole hand down his arm or leg. He grasps his shoulder or his arm with his whole hand, or grasps his buttock or posterior thigh in a similar way. He never uses one finger to point at it, and quite often the patient seems somewhat confused, or unsure about the course of the pain. In the less severe case the patient walks carefully to avoid any jarring motion of the spine. In mild cases - the stage of incomplete remission - he may be conscious of only some aching, and that a particular spinal motion hurts. We know from our own operations, and the experiments of Hirsch and others, that the fibrous mass is much smaller in volume than the original jelly; hence, as this change takes place there is a tendency for the nucleus to retract from the sensitive posterior annulus. If so, in two or three weeks the pain may be considerably relieved. This phenomenon has resulted in undue credit being given to a variety of treatments such as bed rest, the application of ineffectual traction in hospital, and physiotherapy treatments. As the pain of an acute attack abates spinal motion becomes freer. Eventually and inevitably, sooner or later, flexion movements of the spine will drive the fibrous nucleus back against the posterior annulus. Patients soon learn to avoid, as far as possible, flexing their spines. They pick up objects, for example, by bending their knees. Flexion cannot be eliminated completely. Even when they are asleep people flex and rotate their spines a good deal. Eventually the eroding nucleus will contact a sufficient number of end organs of the nervus sinu vertebralis and radiating pains will begin. A movement of the spine may move the nucleus away from the annulus with relief of pain and another movement may drive it back again. Hence the fluctuating course of the disease. It is perhaps better described as being one of acute exacerbations and incomplete remissions. Ultimately in a very small proportion of the cases the nucleus wears its way into the spinal canal. In a small proportion of these "herniated discs" a nerve root is trapped and compressed and paralysis attributable to that root occurs. And, in a very small proportion of the last group (as a result of haemorrhage), bladder and bowel symptoms occur. Clinical observations confirm the conclusions formed from the pathological findings that there is no tendency to spontaneous recovery from these lesions, until after the age of fifty when the fibrous nucleus finally becomes broken up into minute harmless pieces. Many English doctors, in increasing numbers, from Sir James Paget to the present generation have practised manipulation in the treatment of backache and have recorded their findings. Another group - mostly Continental European and North American orthopaedic surgeons and neurosurgeons - have done a great deal of investigation into various aspects of the problem. Their work, some of which has been noted in previous chapters, largely consists of detailed physical examinations as well as surgical, pathological and other laboratory investigations. It may therefore be interesting to compare the reports on the symptoms made by a few men from each group, neither of which apparently was aware of the work of the other; at least in their articles little or no reference is made by one group to the other. Since they were all reporting on almost exactly similar patients the accounts of the symptoms have a strong family resemblance. European orthopaedic surgeons use the term "cervico-brachialgia" to describe pain in the neck associated with pain running down the arm. In the last twenty-five years English doctors have, rather hesitantly, swung to the vague term "disc lesions." Before that, Mennell1 had recorded these symptoms and the results he obtained by manipulation of the spine. He thought that the only possible explanation was subluxation of the posterior intervertebral joints. As neither radiologists nor surgeons were able to demonstrate the subluxations Mennell's valuable work was largely ignored. In his last book' he indicated his doubts about subluxations but he was by no means satisfied with "disc lesions" or "herniated discs." Brachialgia as a syndrome was first described by Valleix2 in 1841 and it soon came to be attributed to neuritis, funiculitis or radiculitis, arising in the brachial plexus or the nerve roots - a conception of the etiology which persists. A drastic example was described by Valleix in which the pain was so severe that the arm was amputated, but the pain remained after the operation. Barre3 in 1926 and Lieou4 in 1928 drew attention to headache as a component of the brachialgia syndrome. They thought it might be due to compression of the vertebral artery and its accompanying nerves by lateral osteophytes. Lennart Hult (1954) is a Swedish orthopaedic surgeon7. In his remarkable study of spinal pain - The Munkfors Investigation he examined two thousand men who were at the time actively employed as industrial and forest workers. He studiously avoided preconceived ideas and his analysis of the stiff neck- brachialgia syndrome was based almost exclusively on this study. 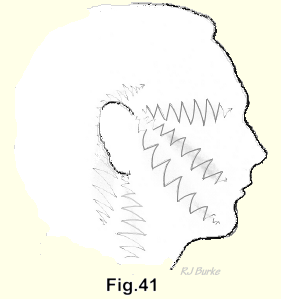 The men examined were drawn by lot and complete physical, laboratory, dental and x-ray investigations were performed. He found the average age of onset of the spinal pains to be twenty-nine years, and in no case was an initial onset after the age of forty-nine reported. He observed that the "usual medical textbooks made no mention of stiff neck, while brachialgia as a syndrome is described in unclear and diffuse terms. It is therefore surprising, when studying this series of normal, able-bodied men, to find that one af ter another, in almost monotonous fashion, described the typical symptoms of "stiff neck -brachialgia," which they had suffered on one or many occasions." He found that the syndrome of stiff neck -brachialgia had occurred in about eighty percent of the workers he examined. Despite the magnitude of these figures he believed that "they undoubtedly represented minimum levels, since it was often difficult for the patient to remember having had a stiff neck." Moreover, his series did not include workmen who were absent from work at the time of his investigations7. Braaf and Rosner (1960) reported on a study of more than two thousand patients with chronic headache. They thought that the cause of the headache in over ninety percent of the patients was "a mechanical irritation of the cervical nerve roots, usually the result of previous trauma to the neck." They found that localized cervical tenderness, spasm of the muscles of the back of the neck and restriction of neck movements are constant physical findings in cervical headaches. They observed that the headache is usually intermittent or recurrent in nature, sometimes occurring daily; and it is rarely the only complaint. They described associated pain in the upper extremities, and occasionally in the thorax, eyes, ears, nose and throat. They also made a point of the fact that the patients complained of being fatigued and generally irritable8. 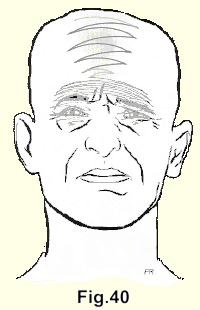 Mennell9, besides reporting all these symptoms, was the first to mention the "facial neuralgias" as part of this syndrome. The connection between stiff painful neck, headaches and brachialgia was also observed by Holbrook10, Gunther11, Kerr12 , Bisgard13, Kelly14, and Raney15. They thought it might be due to spondylosis and cervical root involvement. Many of these authors noted paraesthesiae - tingling and numbness and a sensation of coldness in the hands and fingers - to be common, though none of these subjective sensations could be confirmed by clinical examination. They noted cervical spondylosis, narrowing of the intervertebral foramina and of cervical interspaces and thought that these changes were probably the commonest cause of the syndrome. Some authors divided the ache or pain into the arm into two different components, the "deep pain" and the "typical dorsal nerve root pain." The deep pain, they said, is a stubborn ache in the shoulder, often radiating to the upper arm and down towards the elbow. It seldom extends past the elbow but reaches the back under the shoulder blade. The rest of the pain in the arm was regarded as "typical dorsal nerve root pain." There is no longer any point or advantage in attempting to separate "deep pain" from other pain. It is an artificial distinction. It is all radiating pain emanating from an intervertebral disc and adjacent structures supplied by the nervi sinu vertebrales. It has no connection with the nerve roots. Nuclear lesions occur just as frequently in the thoracic spine as they do in the cervical and lumbar regions. Usually they cause a mild nagging ache about which patients do not seem disposed to complain, but more severe pain does occur and, rarely, it is excruciating. Sometimes it disturbs sleep so that the patient may only be able to sleep for an hour or two and then has to get up and walk around in an attempt to get some relief. He may have to repeat this two or three times during the night. It is a curious fact that in dorsal lesions, in contrast to the cervical and lumbar lesions, the patient can locate the level accurately. If there is radiation it may suggest the course of the intercostal nerves and it is likely to be diagnosed as "Intercostal neuritis", or it may run around the wall of the upper abdomen, and cause suspicions of an intra-abdominal ailment. Many authors have noted that pain on taking a deep breath is usually present in dorsal disc lesions and the patient's complaint that "I have trouble breathing" or "breathing hurts me" may mislead his doctor. An important symptom is radiation to the front of the chest which has been called sternal or precordial pain by some writers and pseudo-angina by others. Mennell9 wrote about precordial pain which was relieved by manipulative treatment and he stressed the fact that true angina could not in any way be helped by such treatment. In 1929 Gunther and Sampson" emphasized the differentiation between true and pseudo-angina pectoris as an important diagnostic problem. They stated that the diagnosis should probably be pseudo-angina, if the pain were exacerbated or evoked by movements of the neck, if the patient tolerated exertion, and if the symptoms were not improved by vasodilatory medication. The precordial pain in pseudo-angina almost always occurs when the patient is at rest, while pain from disease of the coronary arteries is often precipitated by exertion or excitement. Many patients have both cervical and dorsal disc lesions and occasionally in these one finds a patient who has precordial pain plus pain running down the left arm. It should not be taken for granted that the patient has coronary artery disease. A mountain of medical literature has been written on "low back pain and sciatica", "lumbago-sciatica" and "lumbago-pseudo sciatica". The radiations are illustrated in the next section. Among English surgeons and orthopaedic surgeons who have practiced spinal manipulation and have noted relief of various pains therefrom are Sir James Paget, Sir Robert Jones, Howard Marsh, Blake, Marlin, Walmsley, Bankart, Jackson Burrows and Coltart. These are familiar names to an orthopaedic surgeon. Some have been mentioned earlier, others will be mentioned later, but admittedly they are not being given due credit. Also, it is unlikely that much of this escaped observation by Hippocrates, Cato or Galen. A diagnostic point is that these are symptoms without signs. It should be noted also that the patient's leading complaint may be only of headache, for example, or of pain in a shoulder, or precordial pain, or pain in a leg. These lesions run a course of acute exacerbations and incomplete remissions. 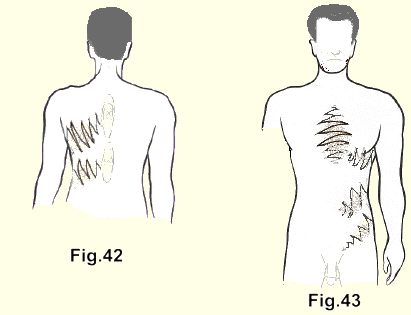 Patients with radiating pains from nuclear lesions recognize themselves in these pictures and they will point out where their pains resemble or diff er f rom the illustrations. (Fig. 39). At first there is pain and stiffness in the neck. In some patients occipital headaches which are "almost pathognomonic of a nuclear lesion of a cervical intervertebral disc"17 start almost immediately, or within a few hours. In others they do not appear for years. Pain on the medial side or around the scapula may be an early symptom. As time passes the radiation proceeds along the supraspinatus muscle. 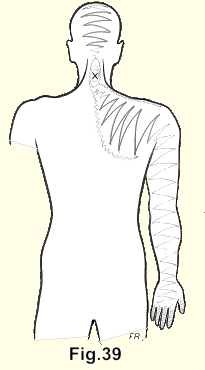 It is followed by pain in the shoulder and pain running down the arm. Sometimes the pain seems to pause for months at the elbow and then proceeds down to the fingers, with subjective numbness and tingling in the fingers, coldness of the hand and fingers and occasionally subjective burning pains in any of the affected areas. The pain may radiate down both arms almost equally or severely down one arm and partially and more mildly down the other. The pain may move from one arm to the other. (Fig. 40). The occipital pain may proceed right over the top of the head. It may be particularly severe across the forehead above the eyebrows. It is not uncommon for the headache to be of prostrating severity, accompanied by nausea and vomiting. This may be diagnosed as "migraine" but it is profoundly open to doubt whether migraine exists except as a label for the radiating. pains in nuclear lesions in cervical intervertebral discs. At least neither I nor any of the doctors whom I have trained in the manipulative treatment of these lesions, have found a case which does not respond satisfactorily to this treatment. Quite frequently the patients complain of a vague but disturbing discomfort in their eyes and many of them have been to see an eye specialist before they are referred to an orthopaedic surgeon. Pain at the bridge of the nose is sometimes severe. The patients may complain of "pain in the throat" which actually is referred to the anterior wall of the neck. Pain at the bridge of the nose is sometimes severe. The patients may complain of "pain in the throat," which actually is referred to the anterior wall of the neck. (Fig. 41). The pain may run up to the ear or around the mastoid process. It may radiate into the face. As always in nuclear lesions, the pain, even though it may be excruciating, is diffuse and difficult for the patient to localize. He will pass his whole hand rather vaguely from back to front over his face to indicate the course. Faintness or dizziness without evident cause is also an occasional symptom of nuclear lesions in the cervical spine. Some patients complain that when the cervical nuclear pain is severe they feel woolly-headed, are unable to concentrate and that their memory is affected. Long experience has taught me to listen carefully to these patients and to believe them. To brush them off with haughty contempt and a handfull of pills is a mistake. The secondary effects of cervical lesions are periarticular fibrositis of the shoulder (frozen shoulder), calcification of the supraspinatus tendon and epicondylitis of the humerus.(Fig. 41). The pain may run up to the ear or around the mastoid process. It may radiate into the face. As always in nuclear lesions, the pain, even though it may be excruciating, is diffuse and difficult for the patient to localize. He will pass his whole hand rather vaguely from back to front over his face to indicate the course. The secondary effects of cervical lesions are periarticular fibrositis of the shoulder (frozen shoulder), calcification of the supraspinatus tendon and epicondylitis of the humerus. (Fig. 42-43). Pain in the dorsal spine is followed at a variable interval of from hours to many years by radiation around the chest wall. Sometimes it is particularly severe over the front of the chest, in which position it is often mistaken for angina pectoris, or it may run around the abdominal wall or down towards the groin and may be mistaken for an abdominal disease, especially if the pain is severe enough to cause nausea and vomiting. (Fig. 44). In the lumbar spine the spinal pain is later followed by radiation into a buttock. As time passes it radiates further down a broad area of the back of the leg. It may run straight down or to the lateral side of the leg below the knee, then down into the foot, and analagous to the radiations in the arm, there are the paraesthesiae - tingling, coldness, subjective numbness in one or all the toes. In some patients the pain runs down both legs, but it is almost always more severe and extensive in one leg than in the other. Sometimes it shifts from one leg to the other, and as the pain in one leg is relieved it is increased in the other. (Fig. 45). In the upper lumbar lesions the pain may radiate around the lower abdomen, down towards the groin and to the front or medial side of the thigh. These patients are straight- forward in their description of the onset, course and behaviour of the pain of a nuclear lesion. There is I no objection to asking them leading questions, such as "does the pain run up the back of your head" or "do you feel peculiar sensations in your fingers?" They are not suggestible. They tell their stories easily and clearly and what the patient tells you should be heard and believed. They should be asked to describe the first attack of spinal pain and when it occurred. Often the first attack was so long ago that the patient can only vaguely recall it, or he may have forgotten it, or he may have f ailed to connect the commonplace motion of the spine with the severe pain which followed it. If radiation is present, ask when it started and where it is projected. In many cases the patient connects the spinal pain with the later onset of radiation. Coughing (or sneezing) in low back lesions may cause a jolting explosion of pain in the acute case or during an acute exacerbation; or it may start an acute exacerbation. It has a lesser impact on the less acute cases and in some it does not affect the patient. Cyriax' observed that neither a cough nor a sneeze, nor a deep breath causes pain in the cervical region; that a deep breath, not a cough, hurts in the dorsal region; and that a sneeze or cough will cause pain in the lumbar region. These signs are helpful in many but by no means all cases. Characteristically, when asked to show where the pain is, the patient will use his whole hand to point out the back of his neck, the back of his head, or the top of his head. He will grasp his whole shoulder or his whole upper arm and indicate several fingers in a somewhat confused way, as if, although the pain to him is very real, it is difficult to say exactly where it is. The nuclear lesion is peculiar to the most productive period of a patient's life (age thirty to fifty). As always in medicine, no rule is absolute and many cases will be found above and below this group. Fortunately the older and younger patients are amenable to treatment, and they usually respond immediately. I had a ninety-one year old patient with an acute and very painful torticollis who was relieved by a single gentle manipulation in a few minutes. If for a while the pain recurs and recurs, it must be treated again and again. In children the nuclei are restrained by only a f ew and loose fibrillae, and one gets the impression that the nuclear jelly of one intervertebral disc has been forced, by spinal motion, into a wedgelike shape with the base pressing with unaccustomed force against the anterior surface of the posterior annulus; and that in old people a similar - redistribution occurs in the amorphous nuclear material. A child is likely to state matter-of-factly "my back hurts". If it is obvious to him that his audience regards the statement with indifference he is unlikely to mention it again, though it could be observed that he will avoid playing games as much as possible. If it is only a mild nagging pain a child is likely to try to ignore it. The patient who is suffering from his first attack of a nuclear lesion is almost invariably in excellent general health. It seems probable that only a person who feels well and vigorous will flex and rotate his spine with sufficient abandon to cause rupture of the nuclear fibrillae. Prior to the original accident these patients have been working and playing energetically. In an automobile accident however, anyone may be forced into vigorous flexion and rotation of the spine. The term "whiplash injury" - more a lawyer's diagnosis than a doctor's - has been applied to these cases. They are typical nuclear lesions. If the backache has been running its fluctuating course for many years the patient may have developed an illness which could obscure the picture. Backache is ubiquitous; so it is easy to conclude that because the patient has kala azar, or psoriasis or flat feet or a short leg, or a retroverted uterus - and low back pain, that the one causes the other. In fact, they are not related. One must beware of the post hoc ergo propter hoc trap in thinking of backache. 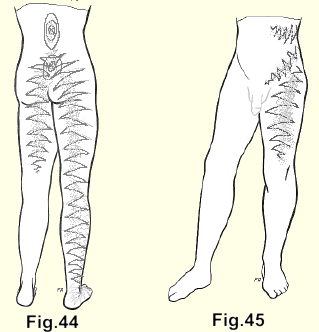 In an effort to find some common factor in a large number of patients with the "lumbago-sciatic syndrome," Friberg and Hirsch17 and Hult7 exhaustively examined from every possible viewpoint, twenty thousand patients with low back pain. A study of their reports indicates that the only common factor actually found was the good health of the patients. In a later article Hirsch18 said "most of those who complain of low back pain are young or middle-aged people with no abnormality elsewhere in the body." A study of the Swedish reports indicates that backache in any part of the spine, plus its radiations of pain, can be equated almost completely with "disc lesions". Our experience has confirmed the observations of the Swedish orthopaedic surgeons, but of course, one must remain aware of the possibility of rare exceptions. It should be noted too that all patients in the Swedish studies were in the working age group. There were no youngsters or oldsters in whom the exceptions occur more frequently. We have observed that the patient with the straight military-type of spine is more prone to backache than those who are generally regarded as having poor posture. Patients who have a marked lumbar lordosis rarely suffer from the "lumbago-sciatic syndrome" and patients with a cervical lordosis rarely suffer from "cervicobrachialgia". Spinal flexion is limited in both groups. Hult7 found the incidence of the lumbago-sciatica syndrome in patients who were actively working at the time, to be about 80 per cent, the incidence of cervico-brachialgia to be about 80 per cent and of dorsal spinal disc lesions to be about 5 per cent. Many patients have two of these syndromes and a lesser number have all three. Hult's figures did not include patients who were incapacitated with backache or for other reasons and were not working at the time of his investigations. Our experience and that of our local colleagues indicates that just as many people have nuclear lesions in the dorsal spine as elsewhere. Usually these patients have a mild, nagging type of pain with a mild radiation or perhaps transient pains suggesting reference along the thoracic spinal nerves, and sometimes discomfort or severe pain over the sternum. Patients do not often complain about the discomfort in the dorsal spine, but, if sought, it will often be found. One should routinely manipulate the thoracic spine in conjunction with manipulation of other parts of the spine. The characteristic vacuum clicks will be felt and heard, and the patients will note relief. The type of employment makes little difference to the incidence, and men and women are equally prone to backache from occiput to coccyx. It is interesting to observe the advertisements on television and other media of mass communication and to estimate how many of them are directed at sufferers from nuclear lesions - people with backaches, headaches, muscular rheumatism, arthritis, neuralgia, fibrositis, bursitis and so on. It has been estimated that in 1964 in the United States there were sixty thousand non-medical practitioners of manipulation. They have endured, prospered and increased in numbers for ninety years. As they work in their offices all day and are not distracted from the treatment of patients by hospital visits or by many house calls, it is likely that during a day one of them sees as many patients as a general practitioner does. As a comparison (in 1964) there were ninety thousand general practitioners in the United. States. If the reader is over the age of thirty the chances are better than four out of five that he has or will have, the symptoms of a nuclear lesion. He might also ask the members of his family if they ever have any of these spinal pains and their radiations. The answers are likely to be a revelation. The profession is urged by authorities to conduct a careful and extensive clinical and laboratory examination in cases of backache. One large text-book devotes ninety pages to an "outline of a routine f or the examination of the back in cases of low back pain". It would take an orthopaedic surgeon about seven hours to complete this routine, and he would not be any better informed when he had finished than when he started. Twenty-nine different physical tests are described, but what logical deductions may be drawn from them is not clear. A major source of difficulty in the evaluation of backache is that our clinical thinking is largely based on the reactions of inflammation and in nuclear lesions there is no inflammation, at least unless and until the fibrous nucleus ultimately oozes into the spinal canal. Even then the inflammation is of only the slightest degree and is beyond clinical detection. As the straight leg raising test is the most popular, it is worth evaluating. If positive, it is supposed to indicate a herniated disc, but Hult "found it to be present in only 2 per cent of the patients who had disc symptoms at the time of the examination; and these were present only when the patient had relatively severe symptoms. It is positive in patients who have tight hamstrings. In them it is normal and present in the total absence of backache. Some patients can touch their toes without flexing their spines. These patients, though they may have a severe backache, with their lumbar spines firmly splinted, are able to perform what is regarded as a normal straight leg raising test. Hult in 1954 noted that in children a great number were unable to allow straight leg raising to 70 degrees, and attributed this to the fact that normal growth of the muscles does not keep pace with the bones. A similar observation was made by the author in 1951 as a precipitating factor in the development of congenital dislocation of the hip. "The growth of the muscles is not exactly synchronized with the growth of bones". A perfectly normal, rapidly growing youngster has a positive leg raising test. It is also positive in anyone at any age who has anything wrong in or around the hip joint. The test, particularly when combined with dorsi-flexion of the foot causes a considerable excursion of the sciatic nerve. At the level of L 4-5 a point on the 5th nerve root, for example, is normally capable of moving more than one inch without the demonstration of any disturbance. If the test is convincingly positive it may indicate that the dural sleeve of a nerve root is being dragged over a bulge in the annulus, or a herniating or herniated nucleus which would increase pain, but it is difficult to see that it would have any effect on the nerve itself, unless it caused a momentary electric shock-like pain. I believe that the test is valueless for the purpose for which it is generally used. All that it usually demonstrates is spasm of the paraspinal, gluteal and hamstring muscles which can be more easily shown by palpating them. As a corollary of this, causing the patient to attempt to touch his toes as part of the examination in a case of spinal pain is a mistake. It yields no useful information. About all that is likely to be achieved is the initiation of an acute exacerbation of the patient's complaint. If (it occasionally happens) a nerve root has been trapped and compressed by a herniated nucleus, paralysis attributable to that root occurs. First it is motor paralysis because of the large size and thus relative vulnerability to pressure of the motor fibres. Greater pressure causes a sensory paralysis. The pain fibres are unaffectedby any pressure short of sectioning the nerve. The paralysis should be recorded muscle by muscle and the power of the muscles graded as is done in patients suffering from the results of poliomyelitis. The grading provides a check on the recovery or increase of the paralysis. The sensory loss is outlined and diagrammed, but neither of these is a reliable guide to the exact level of the herniated nucleus. There is too much overlap in the origin and distribution of the nerves. There is too much variation from one individual to the next and long experience induces doubts about the accuracy of maps of dermatomes. For the same reasons reflex testing is also disappointing as a diagnostic aid in these lesions. The level of the lesion can be determined exactly by the posterior spinous process thrust described in chapter VIII and if need be may be confirmed by a myelogram. The physical examination is largely of negative value. If any of the signs of inflammation are present, or if there is any evidence of fracture or fracture-dislocation of the spine, or if there is evidence of any other ailment, the primary diagnosis will not be a nuclear lesion. However, some observations may be made in patients with nuclear lesions. The patient with an acute cervical lesion is usually up and around. He may hold his head tilted rigidly to one side, or the stiffness in his neck may be barely perceptible. Patients with dorsal disc lesions can usually show that taking a deep breath hurts. In the severe acute low back cases the patient lies in bed or on the floor, immobilized. A few prefer to sit up in bed. While he is absolutely still he is much relieved, but any spinal movement hurts. In the more severe cases there is usually palpable spasm of the paraspinal muscles which, for example, may reach from the sacrum to the level of the mid-scapulae; sciatic scoliosis or a list to one side, a reversal of the lumbar lordosis or a fixed flexion of the lumbar spine so that the patient walks bent forward some 45 degrees. Backache is spinal pain. Spinal pain arises in the spine. In the severe case any spinal movement hurts. In the less severe cases some spinal movement will hurt. This belief can be reinforced by placing the patient in the prone position and thumping with the u1nar side of the closed fist up and down the lumbar and dorsal spines. This will demonstrate that the pain is of spinal origin. The posterior thrust used in manipulation of the spine will clearly demonstrate the intervertebral disc involved. A heavy thrust on the spinous process belonging to the vertebra above the lesion causes a distinctly greater exacerbation of pain than a similar thrust on either the one immediately above or immediately below. In the cervical spine the thumbs may be used to press the spinous processes to and fro. In the whole field of medicine there is not a single test that is more reliable than this one. The distal tip of this spinous process points exactly to the intervertebral disc involved (Fig. 46). Viscerogenic pain is not affected by the patient's movements, or by rest. The exceptions are injuries of viscera, genital prolapse in the female, and nephroptosis. Spinal pain is not a part of any of these. The incredibly vast majority of patients who are suffering from nuclear lesions of intervertebral discs apparently have no physical signs of any ailment whatsoever. This is a serious source of fallacy in a great deal of writing about disc lesions, most of which is done by orthopaedic surgeons and to a lesser extent by neurosurgeons. Besides several hundred other diagnoses these doctors are looking for herniated discs and if none of these can be, demonstrated it is thought that there is no sound basis for the patient's complaints. This emotional and mental stress, if it has been long continued, may cause them to appear to their doctors as neurotics. The patient, who when first seen, is in despair, who weeps Who has been authoritatively told that the pain "is all in your head" or that it is "due to tension" or "psychosomatic", often thinks that he is losing his mind and some quite seriously mention thoughts of suicide. It is easy to jump to a conclusion that these patients are neurotics or malingerers and to get rid of them as quickly as possible with a prescription for some pills. But if they are treated effectively there is no more cheerful, grateful or cooperative group of patients in any field of medicine, They are neither neurotics nor malingerers and very few have "herniated discs". Neurosurgeons get a different but also biased view. Those cases which present a picture of cord, cauda equina or root pressure, with demonstrable paralysis, are likely to be referred to neurosurgeons. They are almost all candidates for surgery. The neurosurgeon is accustomed to finding motor or sensory loss and diminution of reflex reaction. His reaction to the patient with no physical findings whatsoever is sometimes unkind. If there are no "root signs" he may decide that the patient is malingering. In neurosurgical literature the history of disability in these lesions is sometimes given as two days or two weeks, but if the patient had been asked when he had his first backache of that particular type, the doctor would have discovered that it had been at least fifteen or twenty years ago. We do not advise that x-rays be taken before at least a tentative decision has been made to operate on the patient, or until the diagnosis has become definitely in doubt. The clinical diagnosis of a nuclear lesion can be made with comfortable certainty. X-rays and their reports too often confuse the recipient. A report of osteoarthritis when referring to the asymptomatic bone reinforcements around the vertebral bodies may embark the doctor on a futile course of arthritis remedies. The report of a congenital anomaly may precipate other useless excursions. The observation of a narrowed intervertebral disc may only indicate that the nucleus has been reduced to "sawdust" and is no longer a source of symptoms. Occasionally an exostosis is reported in the spinal canal but bony outgrowths do not occur in that part of a vertebral body which forms part of the spinal canal, possibly because of the mild pounding constantly inflicted on it by the fluid-filled dural tube. Rarely, however, a herniated fibrous nucleus does become ossified and this may be a source of confusion. As in all other orthopaedic conditions, the x-rays should be used only to supply confirmation of the diagnosis and necessary additional detail. They should not be used as a substitute for thought. A consideration of the pathology confirms clinical observations that there is no tendency to spontaneous recovery in these lesions until af ter the age of fifty. The patient runs a course which may be mild or severely disabling, of acute exacerbations and incomplete remissions. Spontaneous recovery usually occurs after the age of fifty but if the nucleus has herniated into the spinal canal the patient will not recover unless the mass is surgically removed or it moves laterally and escapes all contact with the nervi sinu vertebrales. It is notable that in people past the age of fifty who suffer simple compression fractures, recovery is smooth and uneventful even without treatment, because the nucleus is a mat of fibrillae which cannot change to fibrous tissue. In patients older than the fifties the nucleus has become a similarly immune amorphous substance. The patient who is well below the age of fifty who has suffered simple compression fractures and whose pain and disability goes on and on interminably has also suffered a nuclear lesion. He is totally incapable of working. Usually he will try, and try hard, but it is impossible for him to continue. His employer will get rid of him; his insurance company, armed with authoritative opinions, will reject him as either a malingerer or a psychopath. He has been destroyed. This picture may apply to anyone who has suffered a nuclear lesion. The patient's story makes the diagnosis. It is confirmed by the snapping sounds elicited by manipulation and the ensuing relief of pain. If these do not occur after several treatments - which is quite uncommon - excision of the fibrous nucleus, or an error in diagnosis, must be considered. The following case has features which make it unique, but it does provide one exception to the sure sign. The patient was a university student who had a nagging pain in his lumbar spine for about two months. It was not relieved by lying down or walking around and it disturbed his sleep. There was a vague radiation of pain into the left buttock. Several treatments of traction and manipulation had no effect. No snapping sounds were obtained but the antero-posterior thruston the spinous process of L3 exacerbated pain. It was noted that the pain was slowly but steadily increasing. X-rays were taken which showed nothing of significance. The patient was admitted to hospital and a myelogram was done which showed an indentation of the dural tube at the level of the L 3-4 disc on the left side. At operation a soft tumour was found lying dorsally to the intervertebral disc at the level of L 3-4. As far as could be determined it was completely removed. It was not possible to be sure of its origin and microscopic sections showed a tumour of extreme malignancy and of doubtful origin. The patient died four months later.